Project based learning and problem based learning are two didactic approaches to learning that are often used interchangeably to refer to the same thing: engaging students in authentic learning activities. This truism does not always hold true. In a learning task that is problem based, the focus is on finding solutions to the problem posed through applying learned strategies and in so doing the process of arriving at the solution is, in and of itself, an integral part of the overall learning taking place . Whether a learning activity is authentic or not does not really matter from a problem based learning perspective because often times 'fictitious scenarios' are purposefully designed to provide learners with a contrived environment to work on their ill-structured problems. 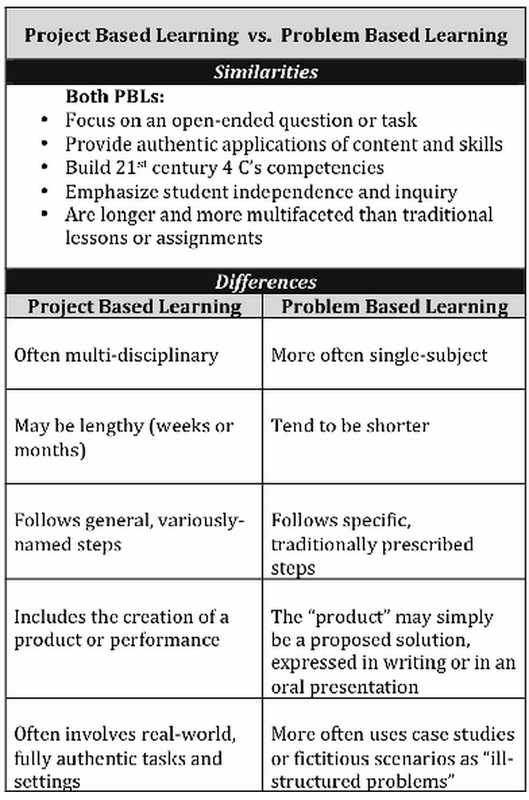 Problem based learning, as is shown in this wonderful chart created by John Larmer Editor in Chief at the Buck Institute for Education, is also different from project based learning in terms of the length or time frame of the activities. While projects in project based learning stretch over a lengthy period of time, activities in problem based learning tend to be relatively short... read on to learn more about the differences and similarities between project based learning and project based learning. You can also check John's original article on this topic for more in-depth explanations.